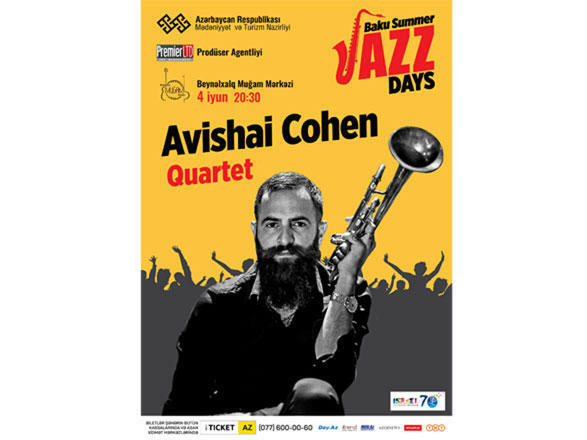 Let's get to know singer one of the festivals participates Israeli trumpeter Avishai Cohen and his quartet. At age ten, Avishai began playing with many bands. As a teenager he toured with the Israeli Philharmonic Orchestra, conducted by such maestros as Zubin Mehta, Kurt Masur and Kent Nagano. Performing with pop and folk artists, Cohen established himself as a professional musician and received a scholarship at Berklee College of Music in Boston. In 1997, the artist consolidated his international reputation by taking the honorable third place at the contest of trumpeters Thelonious Monk Jazz. He recorded his first album in 2003.His brothers are also very talented musicians. Avishai Cohen is called by critics as a rising star of the American jazz scene. Experts note his individual sound and constant creative search. He brilliantly combines various styles of performance. Cohen has stated that he was very heavily influenced by Miles Davis. He is among the most influential and acclaimed figures in the history of jazz and 20th century music. A year after his impressionistic, award winning and critically-lauded ECM debut Into The Silence, Avishai Cohen’s Cross My Palm With Silver (May 5th, 2017) introduces a program of new pieces which put the focus on the ensemble, on teamwork, with an exceptional quartet featuring Yonathan Avishai (piano), Barak Mori (bass) and Ziv Ravitsz (drums).